When I was invited to stay a few nights in Nuuksio National Park in Finland this autumn, I would never imagine waking up to the sound of woodpeckers pecking on tree trunks. It surprises me how I was able to narrow the source of the sound and spot the woodpecker from metres below despite never having seen one in real life before. That’s the effect that the pure forest has on you – it clears your mind, cleanses your thoughts, declutters your senses. There is a certain stillness in the air, that is reflected by the lakes. The lakes’ crystal clear reflections of the Earth would be sights you’d be so accustomed to seeing here. Gradients of greens, yellows and oranges make up the forest in autumn, a sight I undoubtedly believe is the best time to immerse in nature. 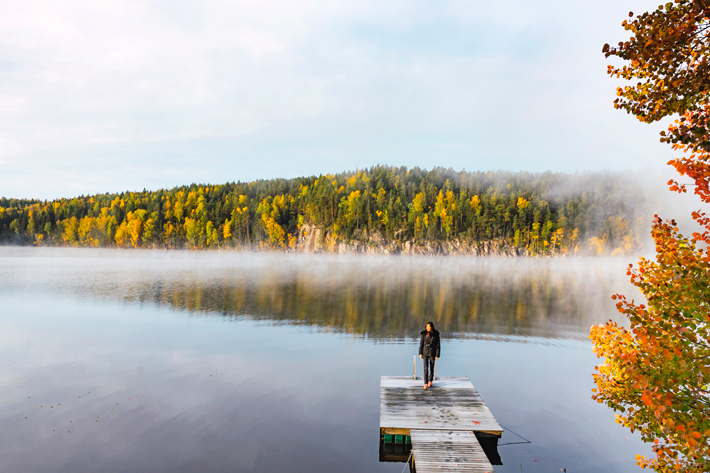 Check out some of the most beautiful sights of Nuuksio National Park! A granite building nestled in the thick of the forest looms into view as our driver pulled in. 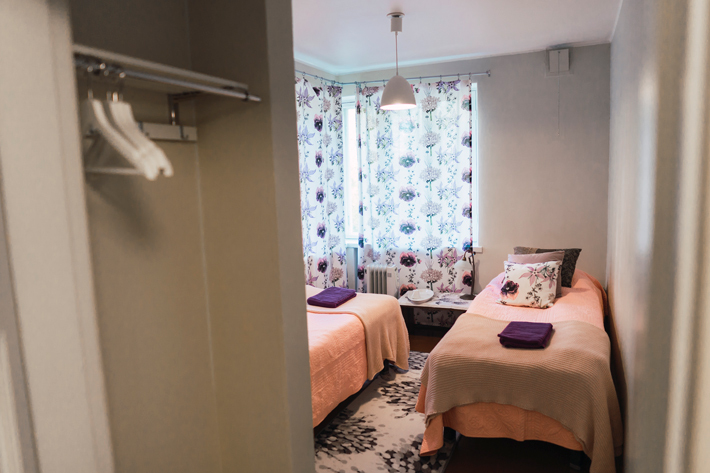 So this is where we will be staying for our first few nights in Finland. As hardy as the concrete building looks, it has existed since 1932, says owner of Green Window, Pekka. As for himself, he has spent 31 years living in the forest, hence his nickname “man from the forest”. 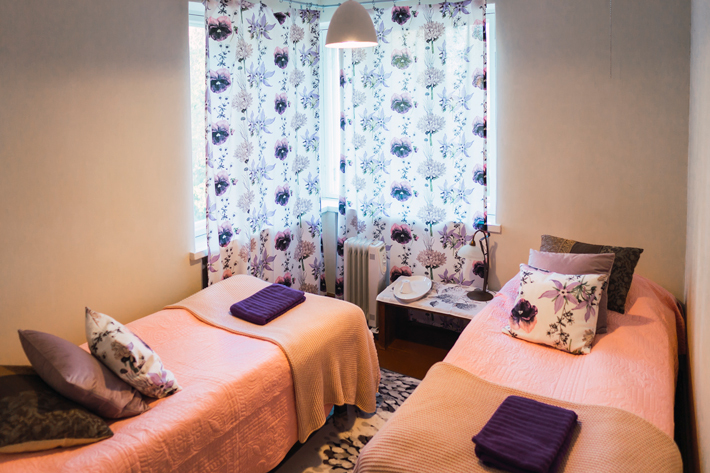 With an availability of 7 rooms on the second floor, Green Window can host a maximum of 16 guests. As we wandered to our rooms to settle down, we spot no sight of bathrooms. Where could it be? Our first stop was to collect wood. 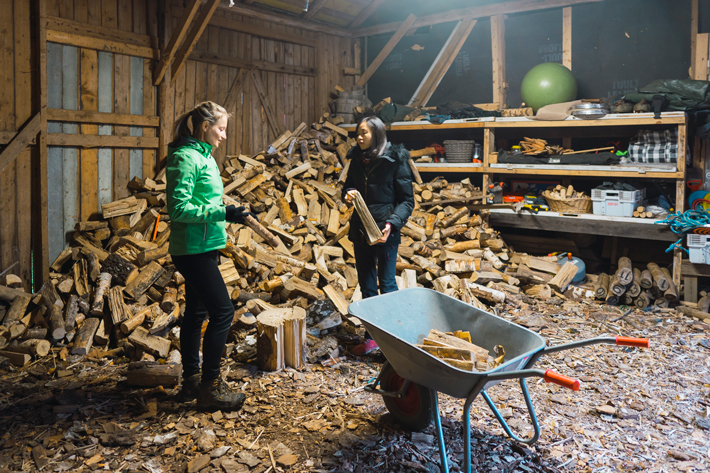 We would learn how to make firewood this morning, and have a taste of traditional Finnish coffee made from firewood. 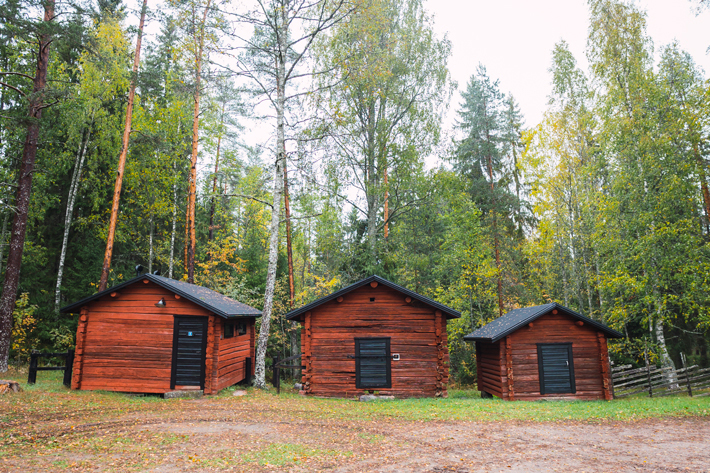 Traditionally, such Lappish huts were made using only logs. 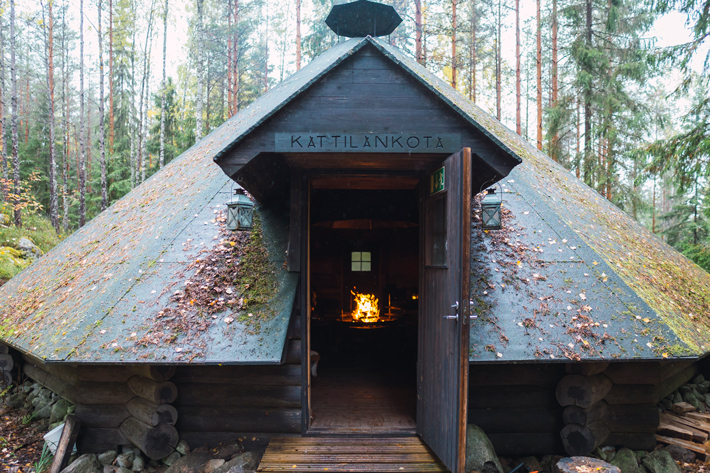 The Finnish aboriginals used them as living quarters as they roamed the forests, building them as they go. In it, it is pitch dark, with the only light source coming from the open chimney in the apex of the roof. From the faint light coming from the entrance, we make out the fireplace in the middle of the hut. We light the candles on the tables that surround the centrepiece and the hut instantly transforms into a warm and cosy ambience. Our guide, Siri, began to show us how to position the firewood so that it catches fire and burns steadily. 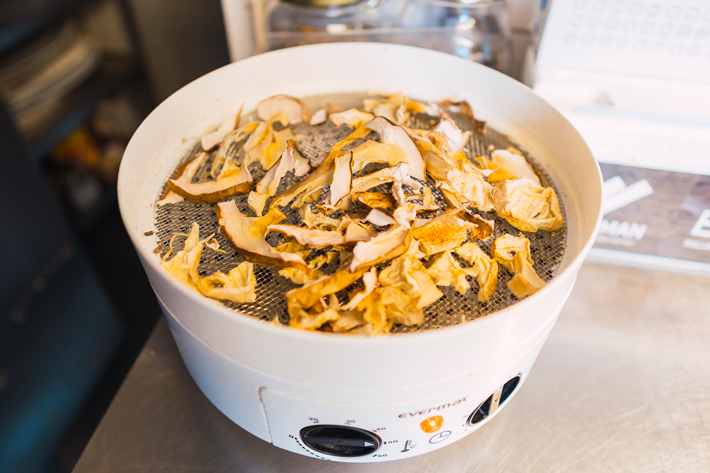 Soon, we were on our way to boiling our black kettle, stained from being engulfed in the smoke. As soon as the water is boiled and the coffee powder have been poured in, she forewarn us that the next step would be a traditional way of making coffee. We nod quizzically as we watched her put a whole burnt log into the kettle with a thump. 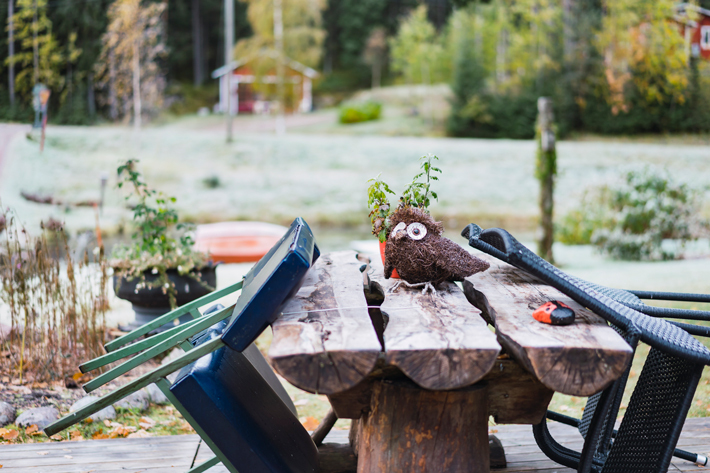 So… that’s the secret ingredient in traditional Finnish campfire coffee – burnt log. It certainly caught us by surprise, but not as much as the taste of the coffee. 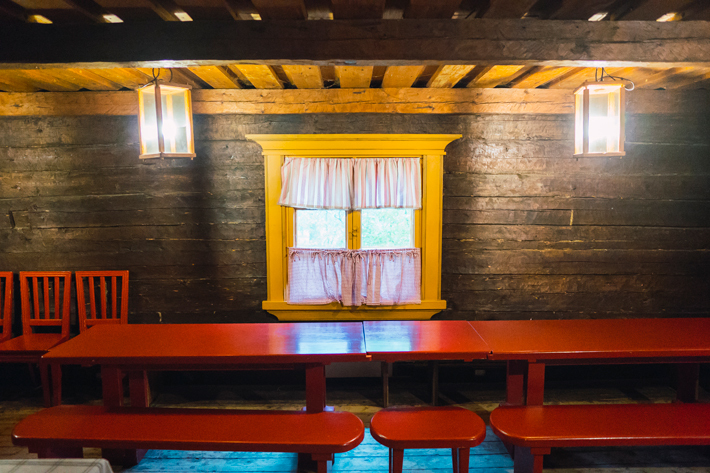 As for the red log cabins a couple of metres away from the main building, they’ve existed longer in the forest than any other buildings around here – since 1840. 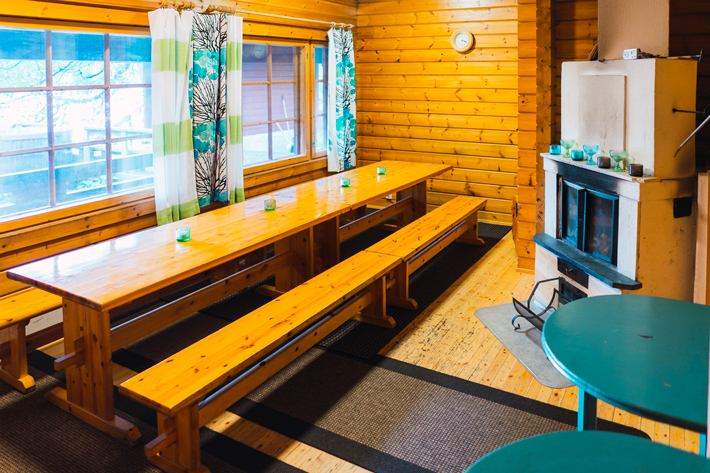 They are now used to hold gatherings and are also rented out for campers of Nuuksio National Park. 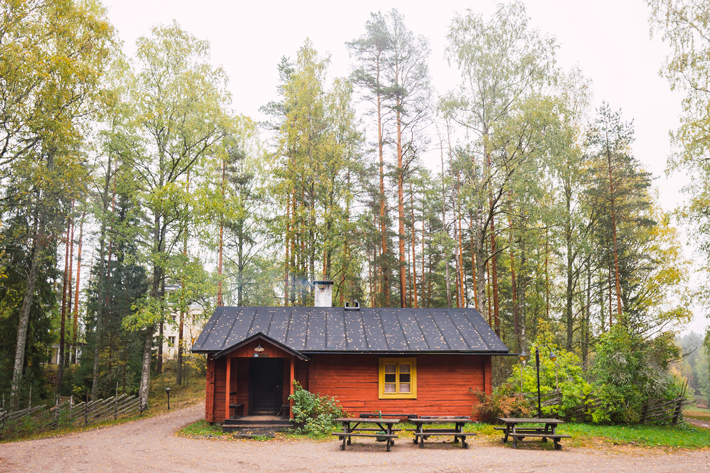 When asked how the iconic red colour on the log cabins that are emblematic of Finland and Sweden come about, our hiking guide, Daniel, comments that it historically came from the red mud that was commonly found around and cheaply available in the past. It has since then sprawled all around the country and is now an iconic character of Finland and Sweden. It is also the site where we first learned how to cook wild salmon on open fire. 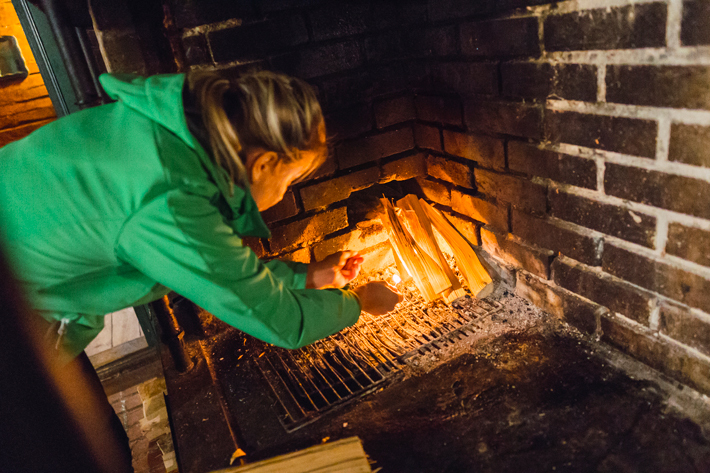 We engage in an evening of preparation of salmon one night, adding coarse salt on the salmon surface and then attaching wooden sticks to secure it on a wooden board, followed by placing them directly on the open fire. Cooking a salmon several kilograms large takes longer than it looks. Ample preparation has to be done. We waited close to 4 hours for this fresh salmon to be cooked. It’s a good thing Green Window has no shortage of saunas for us to while our time (3 saunas to be exact!). And that is exactly where we were headed next. 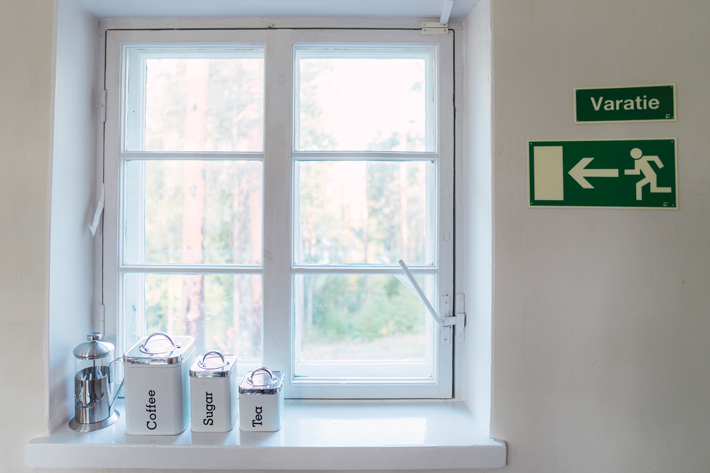 Green Window has a total of 3 saunas – electric sauna, wood-heated sauna and traditional smoke sauna. 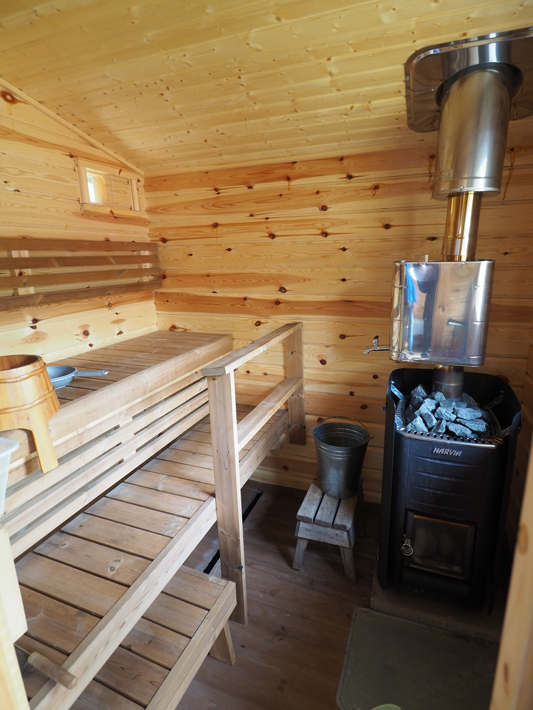 Since the first 2 were more common, we were intrigued to experience a smoke sauna. Smoke getting all over the place – noses included. Traditional smoke saunas existed long before wood-heated stoves were used. The difference between smoke saunas and modern saunas are that modern saunas have a chimney to let the smoke out. Smoke saunas, on the other hand keep the smoke of the fire in, along with the heat of the stove. The sauna thus functions on this stored heat. 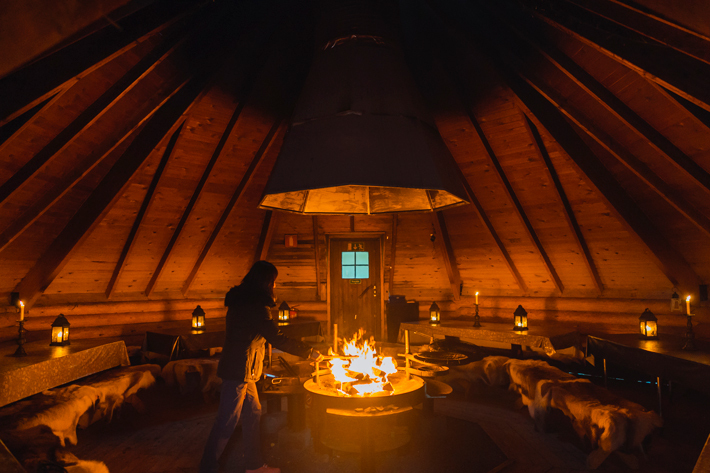 Preparation of smoke saunas is also more extensive than modern saunas, since the fire has to be set up and going on for at least 4 hours before the sauna is ready. 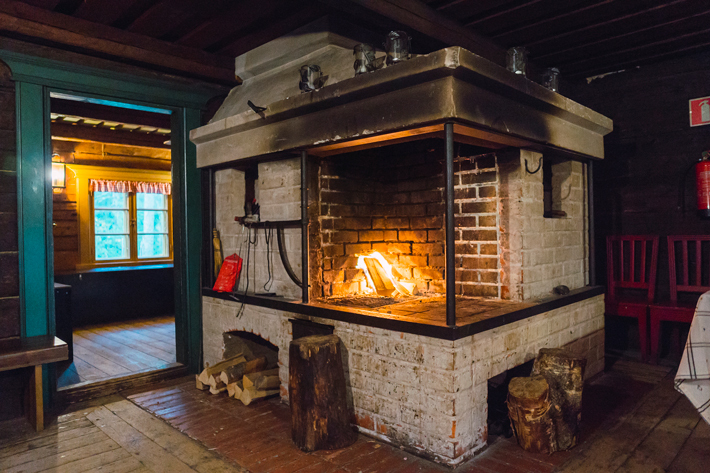 Once the heat is sufficiently stored, the sauna has to be cleared of ashes that result from the open fire – you don’t want to be inhaling smoke instead of enjoying your sauna experience! 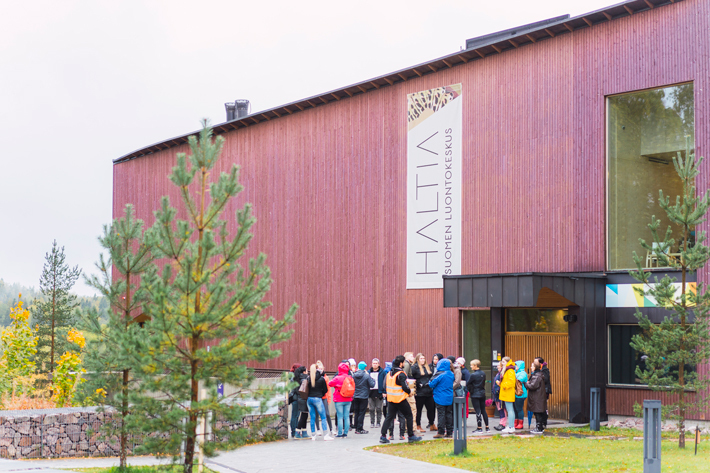 From the different saunas we tried, we noticed that smoke saunas have the ability to keep the heat in more, and it gets really unbearably hot after a couple of minutes of being in the enclosed dark space! 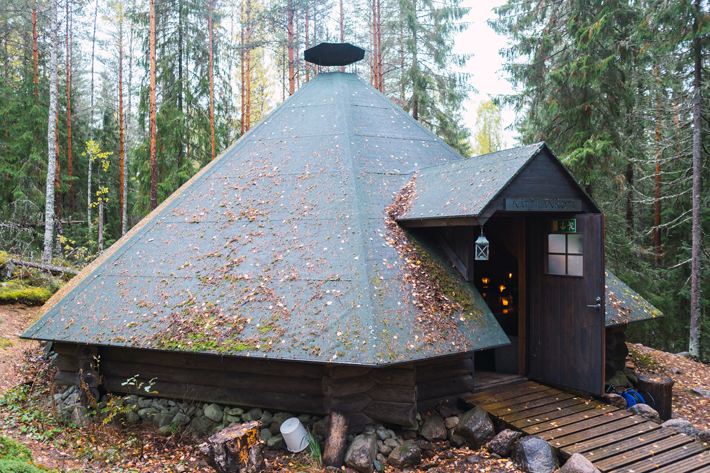 In keeping with its origins, Finnish smoke saunas are also usually enhanced by the lack of lighting. 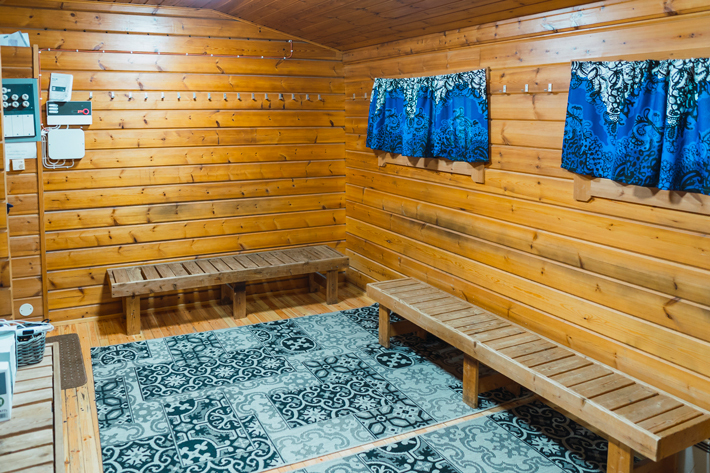 This results in a calm, hushed mood to any sauna-goers venturing inside. Pekka insists we follow through the whole traditional sauna experience, which is to jump into the freezing lake, before retreating to the warm pool. 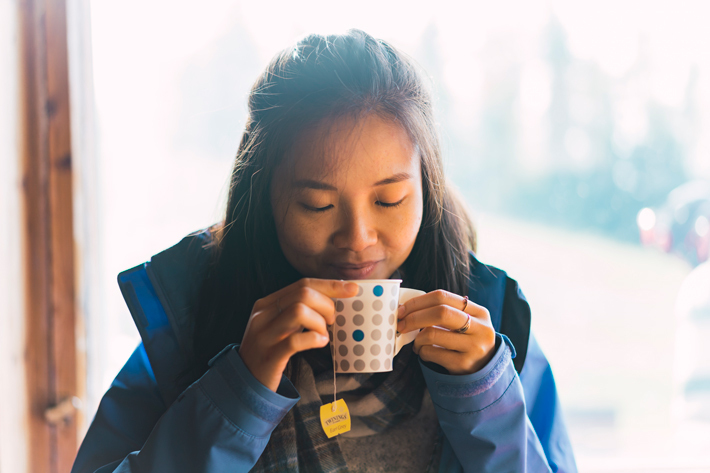 I embrace this exhilarating experience to a T, and subjected my overheated body to overactive blood vessels that tingle on my skin like spikes when I submerged my body into the 8˚C cold lake. I didn’t think I lasted longer than 10 seconds in the cold waters before fleeing to the warmth. 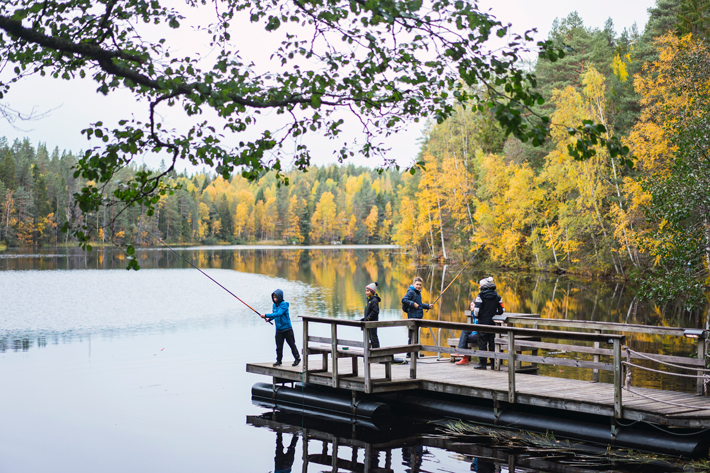 Fishing in the lake amidst the beautiful fall scenery. 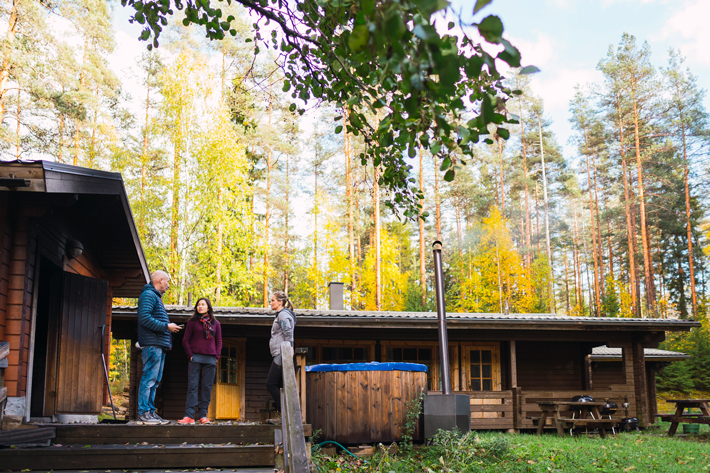 Paired with the beautiful scenery of the Nuuksio National Park landscape and the refreshing cleanse of a swim in the lake, the Finnish smoke sauna is one truly unique experience. 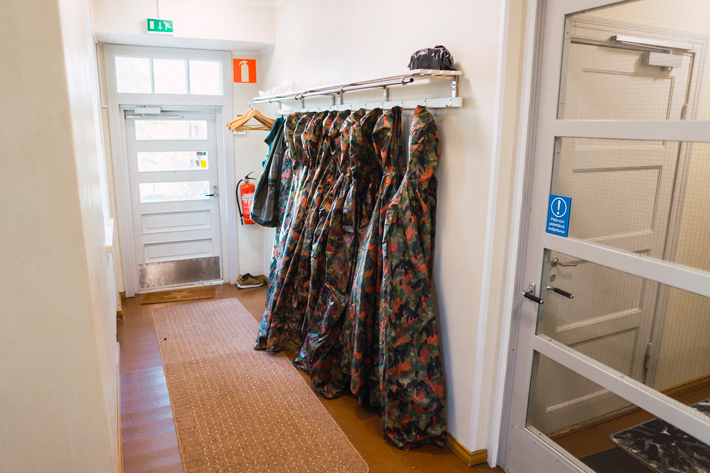 I also notice how the showers were only found by the saunas, which makes me believe that no shower is taken without first immersing in the heated sauna! Get $62 discount off on Airbnb! No surprises – but Pekka is always up before us. 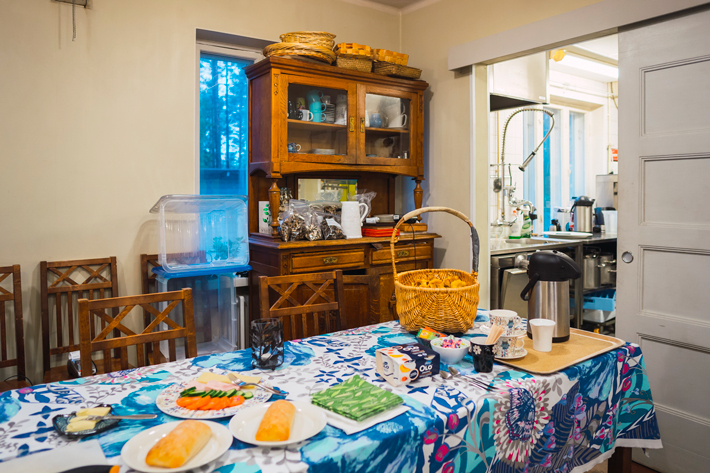 It is always a delight to wake up to a breakfast spread in the mornings. While he looks lackadaisical on the surface, the chef in Pekka certainly is certainly brought out in the way he presents his meals to us. You can see the meticulousness he puts into our meals, including the table setting. His mushroom risotto, in my opinion, is out of this world. It must have something to do with the wild fungi he picked from this side of the earth. Drying out the mushrooms picked from the forest. Just when you think the filling meal is over, he presents us with a sweet dessert. 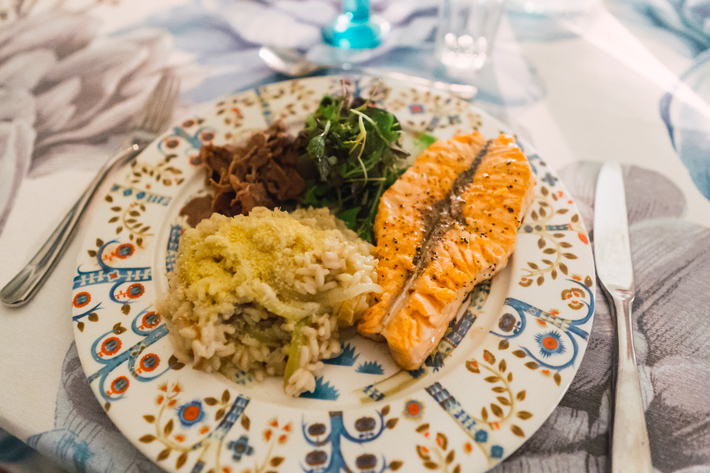 What impressed us most was how all the ingredients that make up our meals are homemade – the fish was fished from the lakes, mushrooms were picked from the forest, apple juice mashed from the apples he picked and puree on the dessert mushed from fruits. It is also a boon that the restaurant serves halal food. 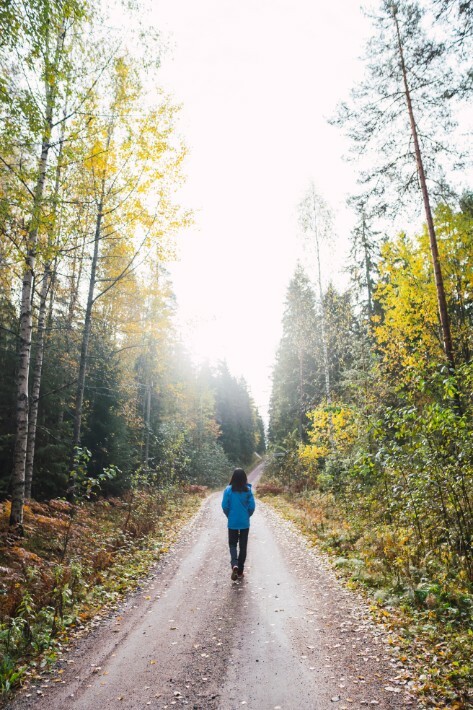 One fine afternoon, our hiking guide, Daniel, takes us on a short hike for a further introduction to the forest of the Nuuksio National Park. 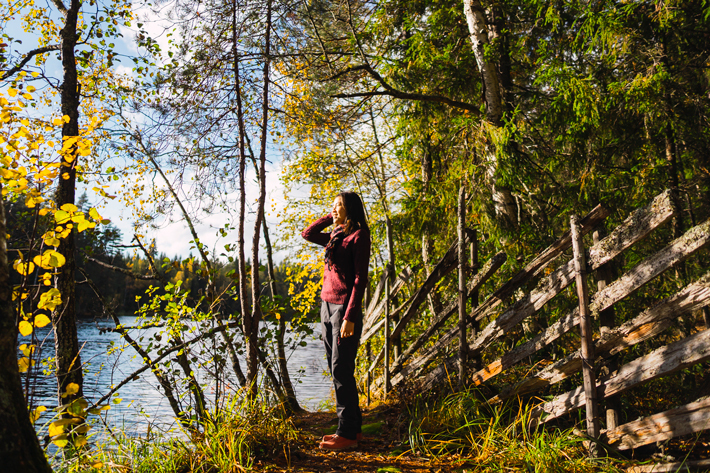 Despite feeling so small in Nuuksio National Park, we are surprised to hear that it is one of the smallest parks in Finland, at 55 km²/ 5000 hectares. Even then, this whole National Park contains some 120 lakes – it’s hard to keep count of the number of lakes as we went through our hike in the forest. If you’re lucky, you can even see elks, moose and deer in the forest. 40 bird species inhabit this ecosystem in winter, while up to 120 bird species can exist come summer and spring. If that is unbelievable, can you believe that 3200 mushroom species exist within the confines of the national park? 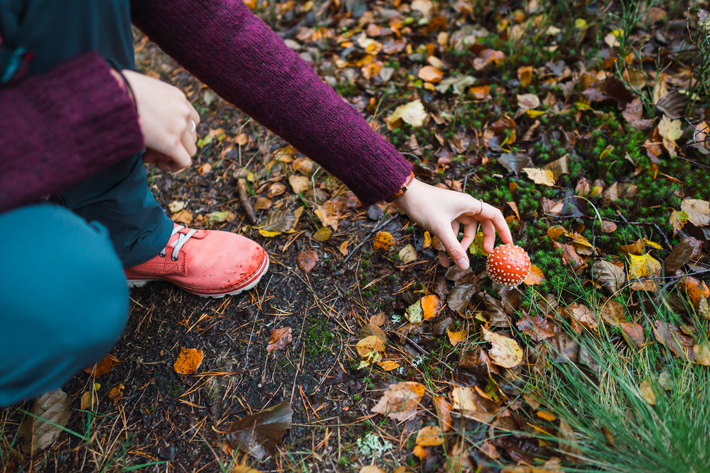 While we initially thought it would be a chore to go mushroom picking, we learned that it is actually pretty common, and an enjoyable pastime, to pick mushrooms in Little Red Riding Hood baskets during autumn when mushrooms flourish. Getting the hang of picking edible mushrooms from the forest! The population of Finnish cannot be said the same. Strangely, the National Park has remained largely uninhabited over the centuries despite nearby Helsinki being so busy and densely populated. 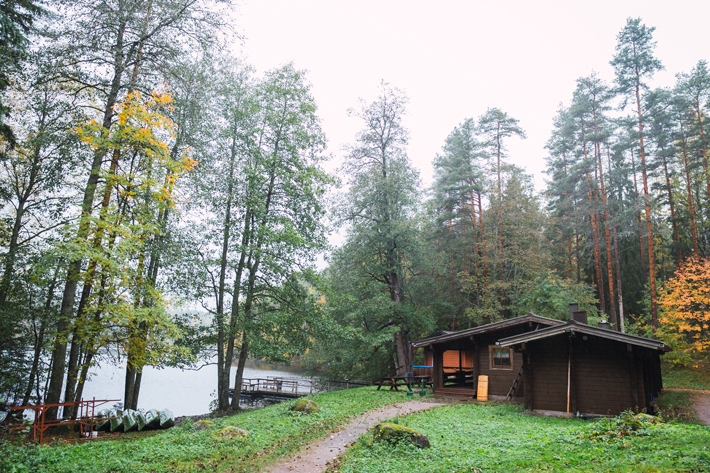 According to those living here, they estimate about 50 permanent residents of Nuuksio National Park. 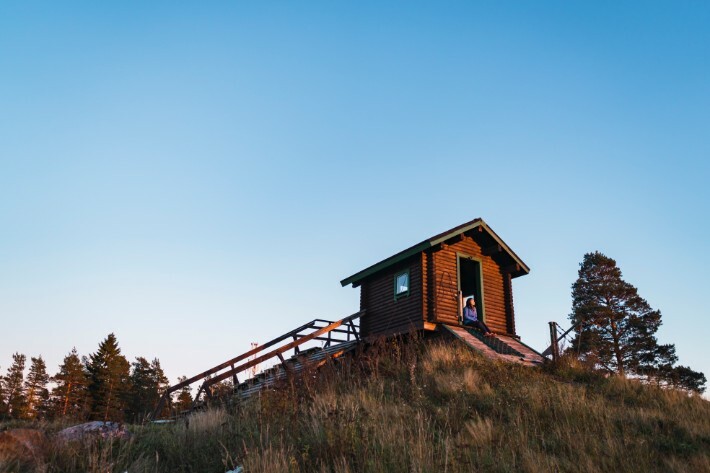 The national park gets more crowded in the summer, when more people from the city come to stay at their summer cabins. 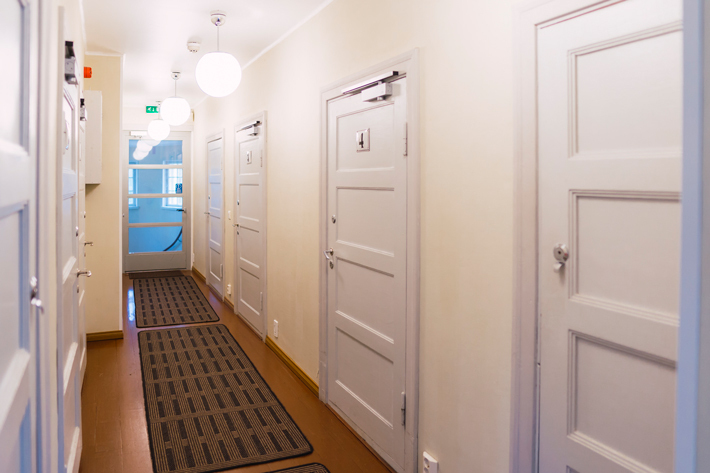 These community of 50 is truly the epitome of the Finnish, of whom value privacy and open spaces. 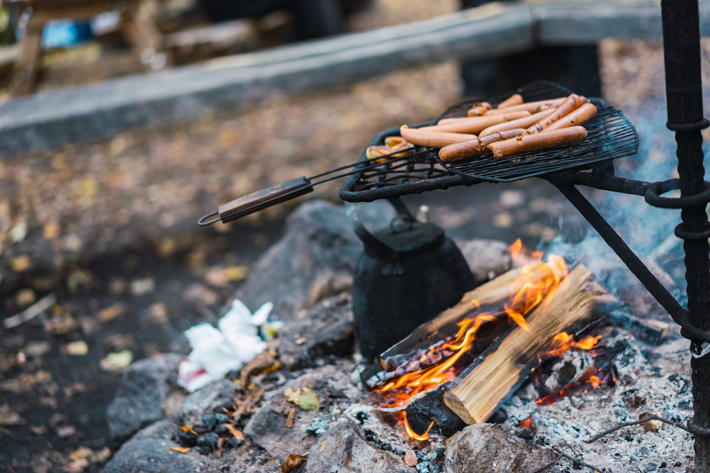 They would rather be camping with no one in sight than to have strangers lurking, which explains why so many city dwellers like to come to Nuuksio National Park over the weekend to camp, make pancakes over a bonfire and hike with their loved ones. 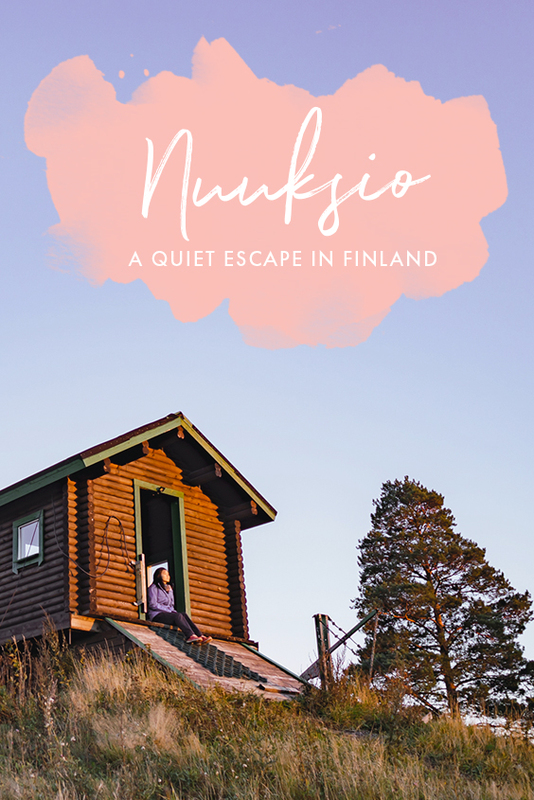 On the days we woke to clear skies, we would head to Pekka’s favourite photo spots and watch the gentle light caress the tips of the trees and get lost in the trees of varying heights undulating the pastel skies. I’d lost count of the number of times we saw the spruce trees turn to flaming orange at each sunset. Watching the works of nature – the shedding of tree bark, the soft mossy ground, the waves of rustling tree sounds or how the gentle light that peeks through leaves bring the faintest of warmth on my cheeks – fills me deep with gratitude and peacefulness. Ski resort in winter, bike park in summer. Nuuksio National Park in winter can go as low as -37˚C and the lakes can be frozen for up to 80 cm, giving the perfect conditions for skiing. 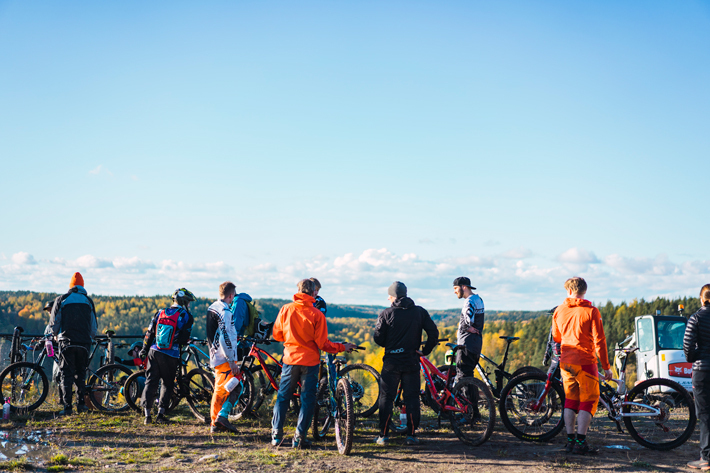 We were brought to Swinghill to witness a local mountain biking competition which coincided with our stay, as Pekka was helping with the preparations for the event. His son also works in the café here, so we spent the better part of some days hiding out from the chilly winds, sipping tea and watching the bikers compete. On our last day, after a short ride around to catch the morning light, Pekka decided on the whim to visit the grandmother of the forest. He casually parked outside a red cabin home and open the unlocked door (I doubt it was ever locked). Greeting us is this 78-year-old cute grandma. Obviously not speaking any English, she gestures to her humble dining table for a cup of coffee. 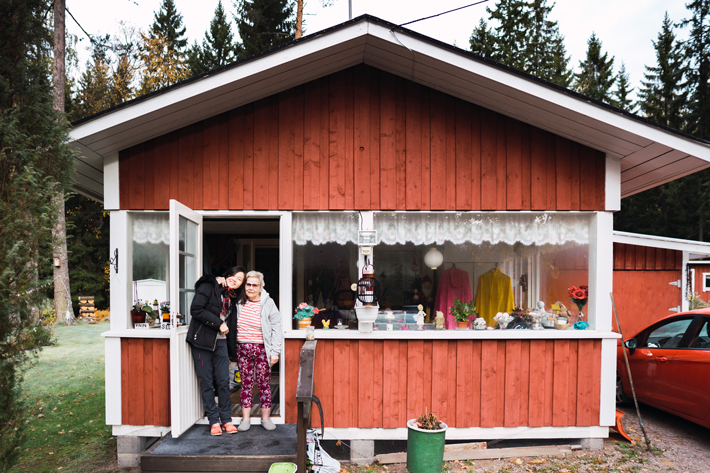 Through our short 4D3N stay here in the forest, we’ve come to learn that coffee is an integral part of the Finnish’s life. You greet guests with coffee no matter the time of the day. 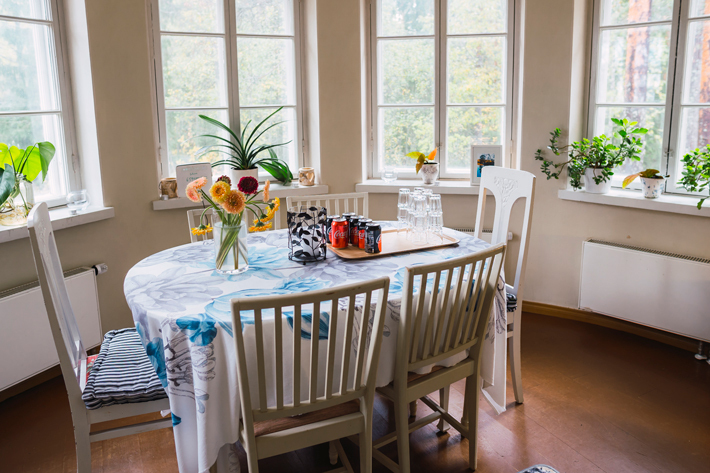 Over our cup of black coffee and table snacks, we gather, through Pekka’s translation, that the area she has been living in has been passed down through 3 generations. Her husband’s ancestral line dabbled in building houses and making bricks. All the houses around this land are hence original pieces. It’s no wonder why her house seems so small in comparison to the vast gardens surrounding it and the forest behind her home. 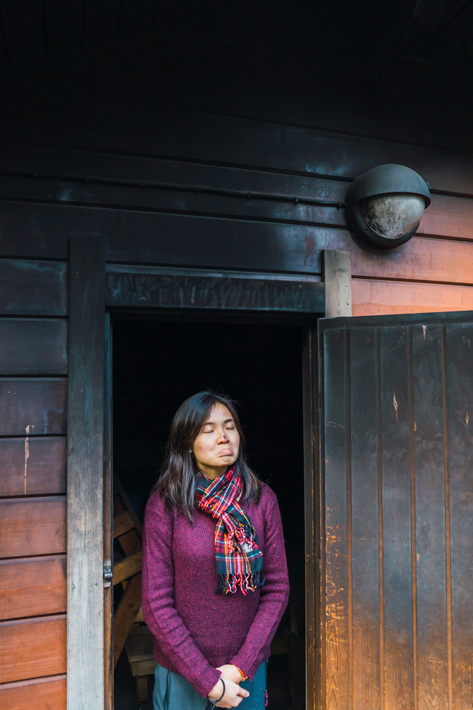 We wondered aloud if she feels lonely living alone while her other sons live in their respective own homes scattered around the forest. Pekka disagrees, commenting that neighbours like him would walk in as and when to keep this little old lady company. 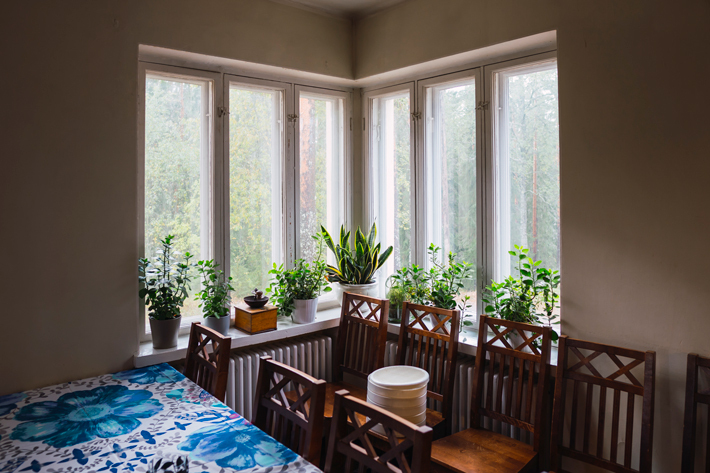 Her groomed garden, balls of knitting yarn on the ground by her rocking chair and little figurines displayed around the house explain how she spends her time, perfectly contented. We also get a sneak peek at her family tree with the various portrait frames displayed around her home – both young and old, her deceased husband and her grandchildren. 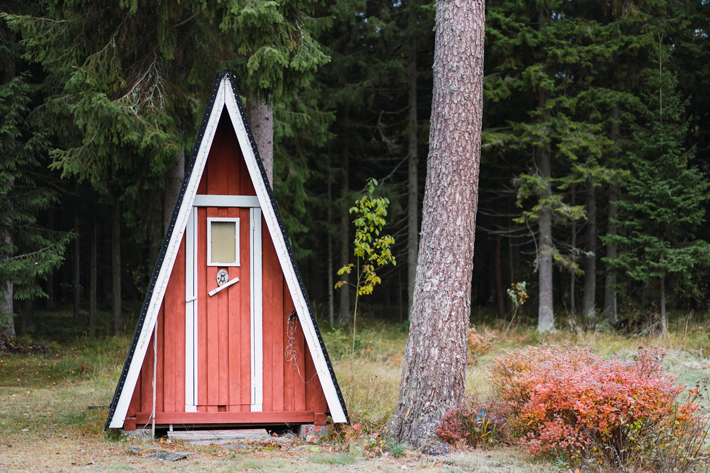 In spite of the humble size of her home, she has a built-in sauna in her bedroom bathroom, and a separate one outside her home in a wood cabin! 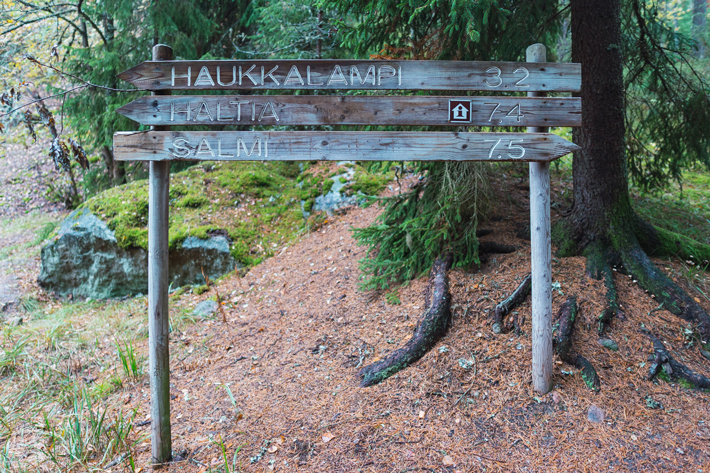 Hiking – There are over 6 hiking trails in Nuuksio National Park, ranging from 2 to 8 kilometres. Pick berries and mushrooms – There are no restrictions on berry and mushroom picking in the National Park. 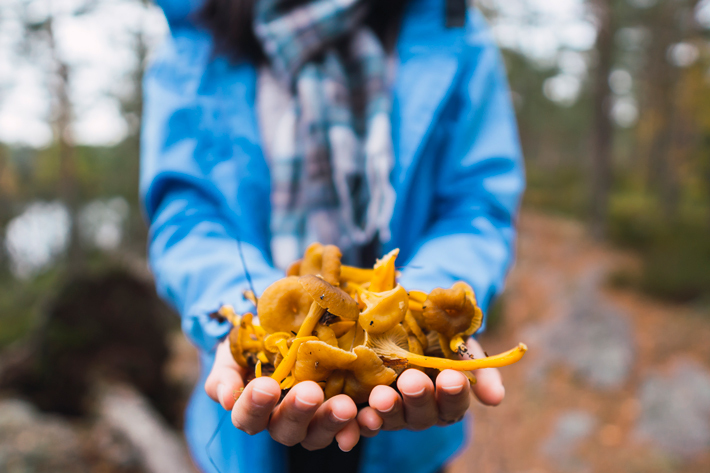 Look out for Nuuksio National Park’s popular bilberries, lingonberries and yellowfoot. Cycling – There are around 30 kilometres of cycling routes in the park. Canoeing – Nuuksio National Park can also be explored by canoeing on Lake Pitkäjärvi. Different parts of Nuuksio National Park are easily accessible from Helsinki by public transport. First, take trains S, U, L or E to get to Espoo. Take bus 245(A) from Espoo Centre. In the winter, the bus will take you to Nuuksionpää. In the summer you’ll get a bit further, to Kattila. Both of these places are located in the National Park and are suitable for starting your hike in Nuuksio. This bus will also take you to the Haltia. First take a train from Helsinki to Leppävaara in Espoo. The regional ticket (‘seutulippu’) is valid for 80 min’s on local trains and busses. Then take bus 238 from Leppävaara to Siikaranta or Siikaniemi in Nuuksio National Park. Take a coach from Kamppi bus station in Helsinki to Tervalampi, from where you need to walk about 2 kilometres to get to the National Park. Driving to Nuuksio National Park from Helsinki is a mere 40-minute drive from the city centre about 40 kilometres away. Living in nature also has the uncanny ability to lull you into deep, peaceful sleep. On several occasions, we were late for the sunrise because we were unable to wake up, haha. Through our quiet evenings spent with Pekka, we have come to enjoy his dry humour about manhood and quiet generosity. 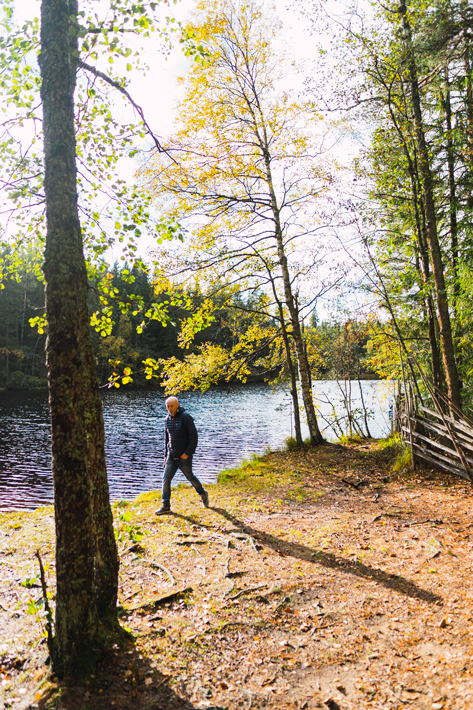 Despite starting his business since 2002 and living in the forest for over 30 years, the beautiful light at different times of the day that casts on Nuuksio still leaves him enthused. Pekka, owner of Green Window, in his element. He took impeccable care of us throughout our stay, treating us as if we were family rather than mere guests of Green Window. He did his best to arrange transport around the park and keep us occupied as much as possible while running the accommodation. We were as hesitant as him to leave after our short stay. 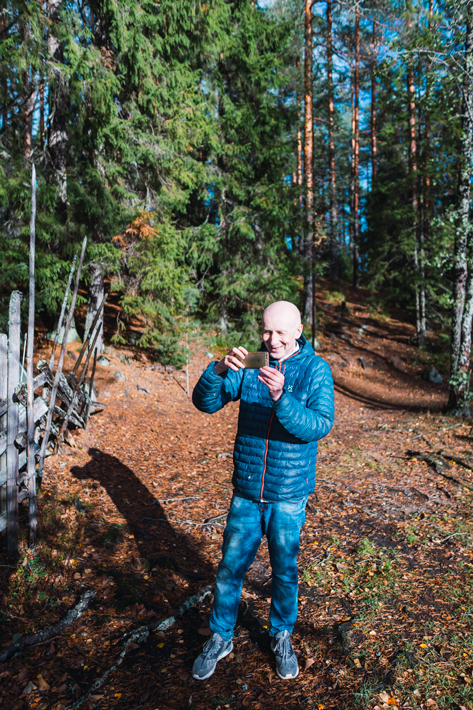 He repeatedly welcomed us back to Nuuksio if ever we got bored on our next leg of Finland – Helsinki. Special thanks to Green Window for this experience! All opinions remain my own.